these cabinets provide clean space for storage of cleanroom garments, wipes, boots, tools and other supplies. Laminar flow cabinets are also great choice for the pharmaceutical, medical, food, electronics, assembly of miniature mechanisms or any other application where clean storage conditions are required to protect the product from airborne contaminants. 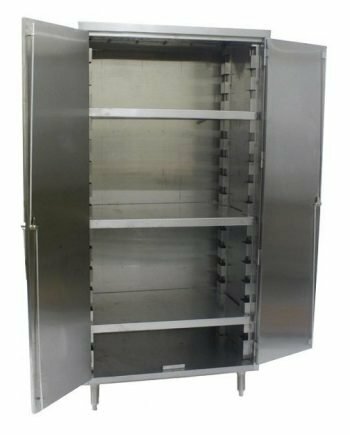 All Stainless Steel storage cabinets with slanted top for laminar airflow. Polypropylene storage cabinets with fan and HEPA filtration provide a particle free storage space which exceed ISO 5 cleanrooms standard. Include perforated shelving for optimum laminar air flow. These storage cabinets feature a quiet blower mounted above a HEPA filter, rated 99.99% efficient at removing particles at 0.3µm or larger.